“Everywhere we went, people were always running after us with one of Gina’s socks and saying ‘Excuse me, your baby lost her sock’. She didn’t lose it. She purposely kicked it off!” Gina Prayer had already developed into quite a character! She had the most beautiful smile and would smile quite often especially during Eskimo kisses and when Wendy made miew-miew noises. She also smiled when one of their dogs licked her head! She was taking great interest in her toys, especially those that rattled and the ones with bright colours. She hated being swaddled, hated wearing a hat and, of course, only liked to wear one sock!! On their very first visit their OB asked whether they had given any thought to amniocentesis. Since they had no intention of terminating the pregnancy they didn’t feel they should risk a miscarriage by doing an amnio. At that time, the worst thing they could think of that could happen was Downs Syndrome and they felt that they could totally love a Downs baby. All was going well until 6 January 2003. Wendy started spotting slightly over the weekend and went to see the doctor. Her regular OB was away, so the replacement sent them down for a level 2 u/s. 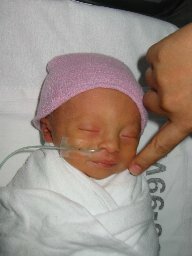 That was when Gina was diagnosed with what they thought was a multi-cystic kidney and possibly a small VSD. The doctor in charge recommended an amnio because these 2 conditions are markers for Downs Syndrome. The spotting had nothing to do with any of these conditions and could have been due to the stretching of the uterus which was about 4 weeks larger for term as there was excess amniotic fluid. They went home and looked up every bit of available information on the internet about multi-cystic kidneys, VSD and excess amniotic fluid. 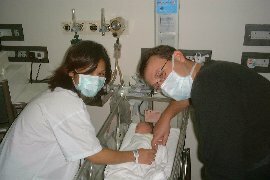 That was when Trisomy 18 started to enter their lives. They agreed to do an amnio a few days later when their OB was back because they felt they needed to find out one way or the other instead of spending the next 4 ? months wondering about it. Some of you may have already heard that we have had the amniocentesis test done to check on the health of our baby after finding out that she only has 1 working kidney. Unfortunately, the results did not turn out as we had hoped. 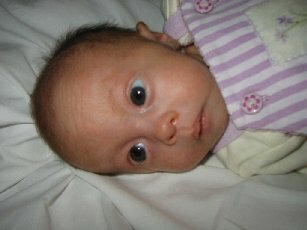 Our little girl has Trisomy 18 which is a defect that affects only 1 in 3,000 to 4,000 babies and there is no known cause. It’s a chromosomal defect. If you wish to know in greater details, please look it up on the net. What it does mean is that she is unlikely to survive. We may be blessed enough to carry her full term, but it’s likely than she would not survive more than a few days. 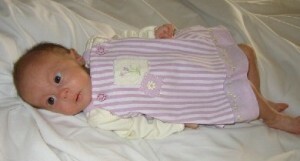 90% of babies with Trisomy 18 will not make it to their first birthday. Please don’t feel bad for us. Scott and I feel incredibly privileged to have her in our lives even if only for a very short time. We love her dearly and would never regret a moment of this. 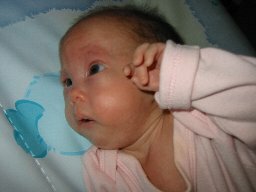 While she’s still here, bouncing about inside me (and they say Trisomy 18 babies don’t move very much – you should check out how our little girl just never stays still! ), we are determined to make her time inside of me and, hopefully, in this world, the best ever for her. This means we’re not going to sit about and mope. This also means that we need your help in cheering us up at times because there will be times when we get a little sad (although we’ll try hard not to inflict this on any of you). Our first request is that you don’t greet us with “Sorry to hear”. We’re not sorry and you shouldn’t be either. Be happy for us that we were given the opportunity to experience this love, this joy. We are ready to carry on. Yes, we’re a little scared about a lot of things right now (e.g: will it happen again? Can we have a healthy child?, etc.) but we are optimistic. Some of you know that, while I’m not exactly a great example of a Christian, I do have my faith in God. He’ll help me through this. Scott also has his faith. And, we have each other and you, our dear friends and family. We are truly blessed. Please keep little Gina Prayer in your prayers. All we ask now is for her to have the best time of her little life (apparently, one of the markers for Trisomy 18 is my slightly larger-than-term uterus. Thank God for that because it means that our energetic little girl has plenty of room for her dancing routines!!). Please keep us in your prayers too. Thank you for your kind support. On May 21, her due date, Gina was still not engaged and didn’t look as if she had any interest in coming out! The OB decided that they should wait a little longer as Gina seemed to be doing well and putting on weight indicating that the placenta was still doing its job. However, by May 29, everyone agreed to induce labour on May 31. 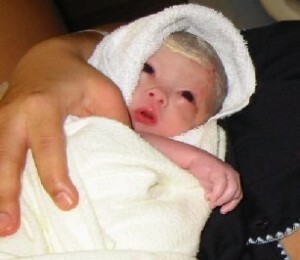 “The day arrived and we were all so excited and, at the same time, very scared.” At one point Gina’s heartbeat started to drop and they were faced with the question of whether to have a c-section. They chose to wait a little longer and Gina did fine from then on. After breaking her water about 11:30 p.m., the contractions really started. Wendy had an epidural that didn’t really help and after several hours, at 3:59 a.m., little Miss Gina Prayer came into the world with her gorgeous big blue eyes wide open. She started breathing after a bit of suctioning help and Wendy was no longer in pain.